This is the book we will be reading soon in PAP Chemistry! The Disappearing Spoon by Sam Kean. Notice the placement and spin of each of the 22 electrons within the orbitals. Notice that the p orbitals are further from the nucleus than the s orbitals. The model of the atom has changed and progressed throughout history. From Dalton to Schrodinger, each model improved upon the previous one as new discoveries were made. The five main atomic models are Dalton’s model, Thompson’s model, Rutherford’s model, Bohr’s model, and Schrodinger’s model. They all differ from eachother in some way, but they do have similarities. There is one thing that all five of the models hold in common: their spherical shape. Whether the model has protons, neutrons and electrons, or no subatomic particles at all, they are all shaped like a sphere. Excluding Dalton’s model, all of the models have electrons. Rutherford’s, Bohr’s, and Schrodinger’s models all contain a nucleus that is located in the center of the atom with the electrons located in the space around the nucleus. Rutherford’s, Bohr’s, and Schrodinger’s models all contain protons in their nucleus. Rutherford’s and Bohr’s models have electrons orbiting in specific paths around the nucleus. Dalton’s model differs from all the others by the fact that it has no subatomic parts. His model proposes that the atom is a solid sphere; that it has no protons, neutrons, or electrons. Although Thomson’s model does contain electrons, it is different from the others because of the electrons placement and the fact that it has no nucleus. In Rutherford’s, Bohr’s and Schrodinger’s models there is a nucleus and the electrons are in the space around the nuclus while Thomson’s model proposes that the atom is a sphere of positively charged matter in which electrons are dispersed throughout. Rutherford’s, Bohr’s, and Schrodinger’s models all have a nucleus, but otherwise they are very different. Rutherford’s and Bohr’s models have protons in their nucleus, but do not contain neutrons. Schrodinger’s model has both protons and neutrons in the nucleus. While Rutherford’s and Bohr’s models have electrons circling the nucleus in orbits, Schrodinger’s model has an “electron cloud” in which the electrons circle the nucleus in certain areas based on probabilities rather than specific orbits. “That’s OK,” replied the student. “It’s important.” He knew his friend has paid $35, and he had been given $50 out of the school’s research budget to get the job done. Holey Ozone! What’s the Problem? Ozone is a colorless gas which consists of three oxygen atoms, one double-bonded to another, and the third loosely bound with a single bond to one of the other two. It is a highly unstable molecule, and will take any opportunity to break apart to form a more stable oxygen atom and a reactive oxygen radical. It naturally exists mostly in the stratosphere, where it acts as a thin chemical shield against solar ultraviolet radiation, but it is produced at ground level by any process which involves an electrical current passing through the air (the “dry” odor you smell when you’re next to a copy machine is ozone, for instance) Ground level ozone has caused serious problems, especially in recent decades as more and more of it is produced by our growing population. It reacts with a variety of materials, including the rubber in automobile tires, and the tissues lining the lung, to name a couple. In the stratosphere, however, ozone absorbs ultraviolet light via the process described below, effectively removing a significant portion of harmful high-energy electromagnetic radiation from the spectrum which reaches us at ground level. Exposure to high levels of UV light has been proven to increase the risk of malignant skin cancers and melanoma, as well as affecting the fragile balance in natural ecosystems. 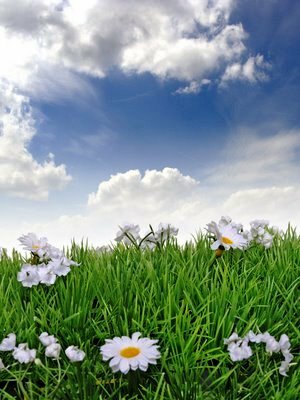 Therefore, any reduction in stratospheric ozone concentration may result in increased incidence of skin cancers and other UV related maladies. Here is the process by which stratospheric ozone is created. A molecule of oxygen is hit by a ray of ultraviolet radiation. This gives it enough energy to split into two oxygen radicals, which go on to hit other oxygen molecules, bonding with them to form ozone. Later, ozone molecules are struck by ultraviolet radiation and break apart into oxygen molecules and oxygen radicals, to continue the cycle. Most people are familiar with an electron, which combined with its subatomic counterparts, the proton and neutron, make up the fundamental particles of atoms. As you probably learned in chemistry class, electrons fit into orbitals or shells around the nucleus of the atom and the size of the nucleus roughly corresponds to how many electrons an atom has and its subsequent number of shells. This simple model of the atom is the building block for much of chemistry; unfortunately, this shell model is only partially true. The true nature of the electron is something much stranger than fiction. What most people are not familiar with is that electrons also behave like waves. It wasn’t until the scientific breakthroughs of quantum mechanics that there was a way to mathematically model subatomic particles. In 1906, Sir J. J. Thomson, a British physicist, proved the existence of the electron and that it was indeed a particle. It wasn’t until the 1920s that the French Physicist Louis de Broglie began to raise questions about the particle nature of the electron. Using Einstein’s two equations for light particles he obtained the simple relation p=hv/c, where p is momentum, v is frequency, c is the speed of light (a constant), and h is Plank’s constant. 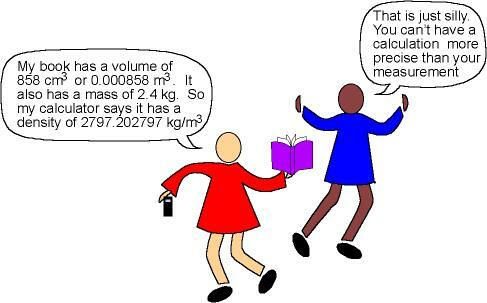 If we substitute the relation for frequency with w=c/ v, this implies pw=h, in other words momentum multiplied by wavelength gives Plank’s constant. The implications of this is that the smaller the wavelength of a particle, then the larger the momentum, making electrons, with their tiny mass (1/1836 the mass of a proton) and correspondingly small momentum, very wave like, i.e. a large wavelength. De Broglie’s work was initially dismissed by physicists as a mathematical trick, and it wasn’t until Einstein saw his work that he quickly realized that matter waves must be real. From 1928 onward, experimental evidence proved conclusively of the wave/particle duality of electrons. This discovery was the first step in realizing that all matter and all waves have a wave/particle duality. It just so happens that for everyday objects, i.e. a bowling ball, train, person, etc, the particle nature is the dominant mixture of the two. The wave aspect is still present in these objects, in accordance with the relation pw=h, although it is totally insignificant because of the large mass associated with these objects. When it comes to very small objects, i.e. electrons, the particle and wave aspects of reality are equally significant, so things do not behave in a way that we can understand from our everyday world. There is no physical analogy with which to completely understand atoms. Atoms behave like atoms and nothing else. 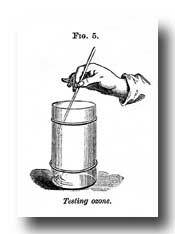 Chemistry came of age as a science in the late 1700s–the same time America came of age as a nation. Over the next two centuries, chemists played key roles in expanding the frontiers of knowledge, advancing medicine and industry, and creating products from penicillin to plastics. This site tells their stories. The American Chemical Society and Day-Glo Color Corp. will celebrate the development of DayGlo Fluorescent Pigments as a National Historic Chemical Landmark on September 8, 2012, at the Great Lakes Science Center in Cleveland, Ohio. DayGlo fluorescent pigments, a new class of pigments based on fluorescent dyes and polymeric materials, were developed between the 1930s and 1950s by scientists at Switzer Brothers, Inc. (now Day-Glo Color Corp.). These pigments absorb various light frequencies (visible and invisible to the human eye) and reemit them, producing intense visible colors that appear to glow, even in daylight. Switzer Brothers, Inc., introduced novel processes that eliminated the limitations in light fastness and color strength of earlier fluorescent pigments, resulting in new applications in advertising, packaging, flaw detection and safety. Yangtze River Turns Red and Turns Up a Mystery: Physical or Chemical Change? 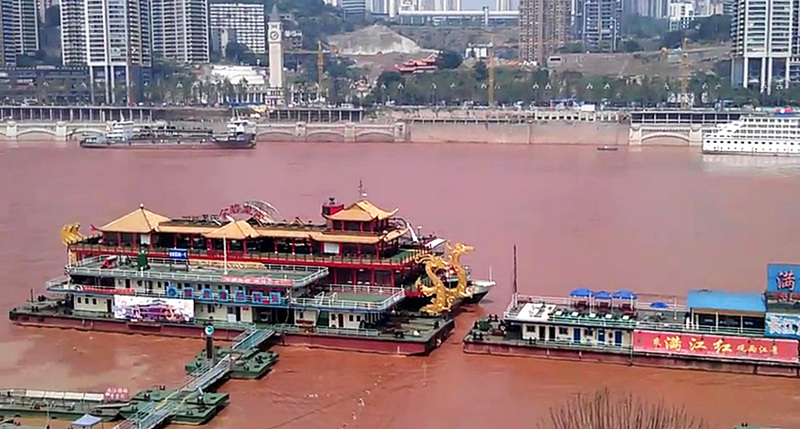 via Yangtze River Turns Red and Turns Up a Mystery. What are the possible reasons for this color change? What are scientists investigating as suspect sources? What do you think: Is this a physical or a chemical change?